In this article, we'll show you how to display data from your Twitter account on your Geckoboard dashboard. 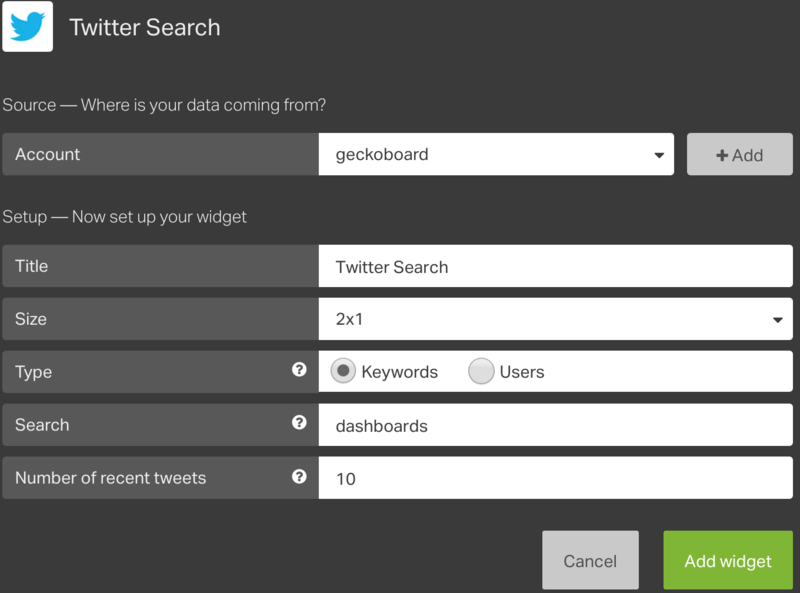 Search for Twitter using the Search sources field. Alternatively, you can also scroll down the alphabetical list of integrations until you reach the Zendesk integration. Click on the Twitter integration. Skip to configuring your widget? 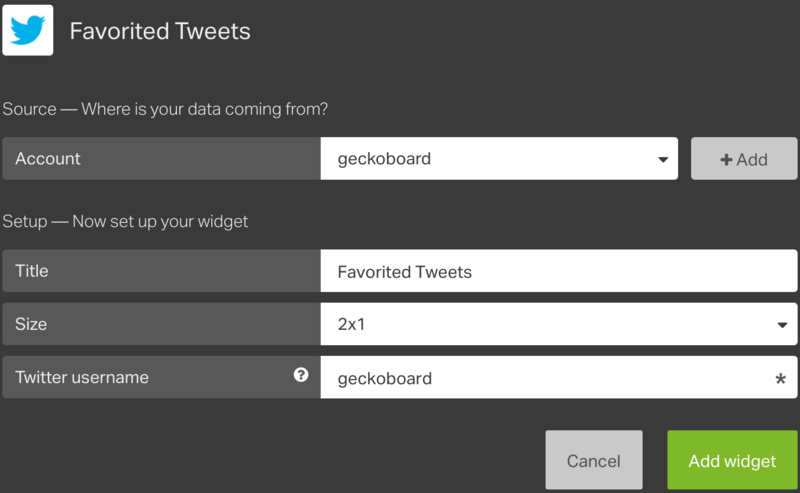 If this is your first Twitter widget, you'll need to connect your Twitter account to Geckoboard. If not, you can skip to configuring your Twitter widget. When adding your first Twitter widget, you'll be asked to create a connection and authenticate your Twitter account so that we're able to collect your data and display it on the dashboard. You only need to create this connection once – we'll take care of the rest. You will be briefly taken to a Twitter authorization page so you can confirm this. 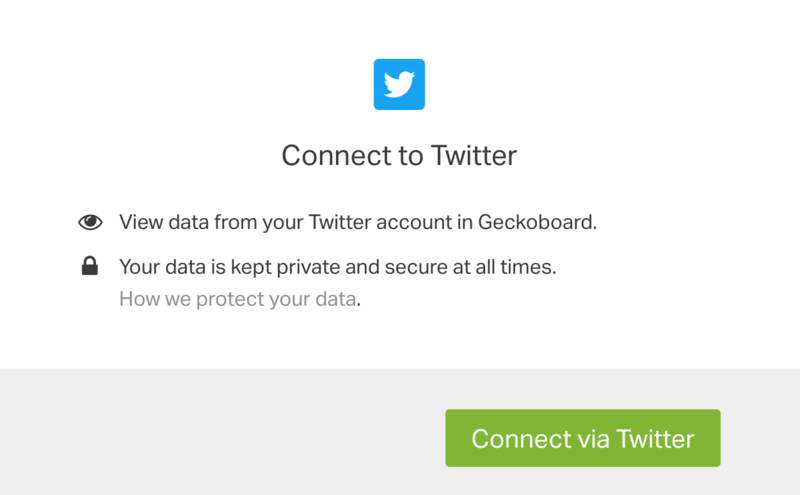 Twitter uses OAuth for this authentication so your logins are not shared with us. Click on the Connect button. Our Twitter integration uses OAuth to connect to Twitter, so if you're already logged into Twitter on your browser, you will jump straight to the widget configuration screen after a few seconds. 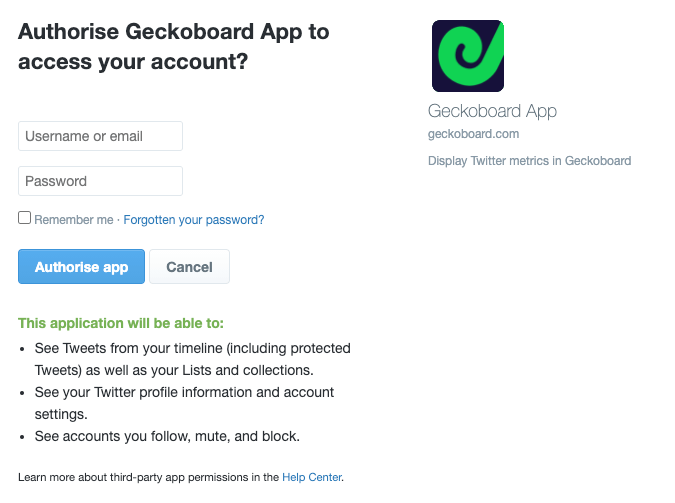 If you're not logged in to Twitter, a popup window will appear and allow you to log in for account authorization. 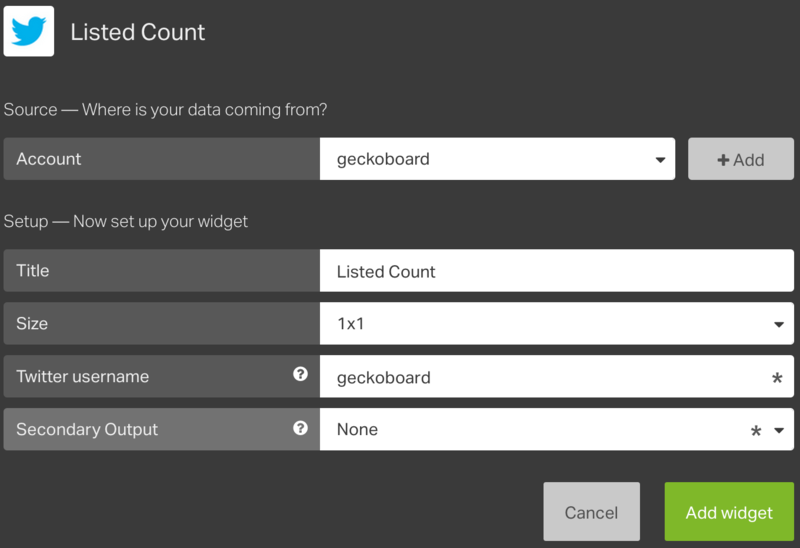 You're now ready to configure your widgets! For the purposes of this tutorial, we will be tracking the metrics of the twitter handle @geckoboard. 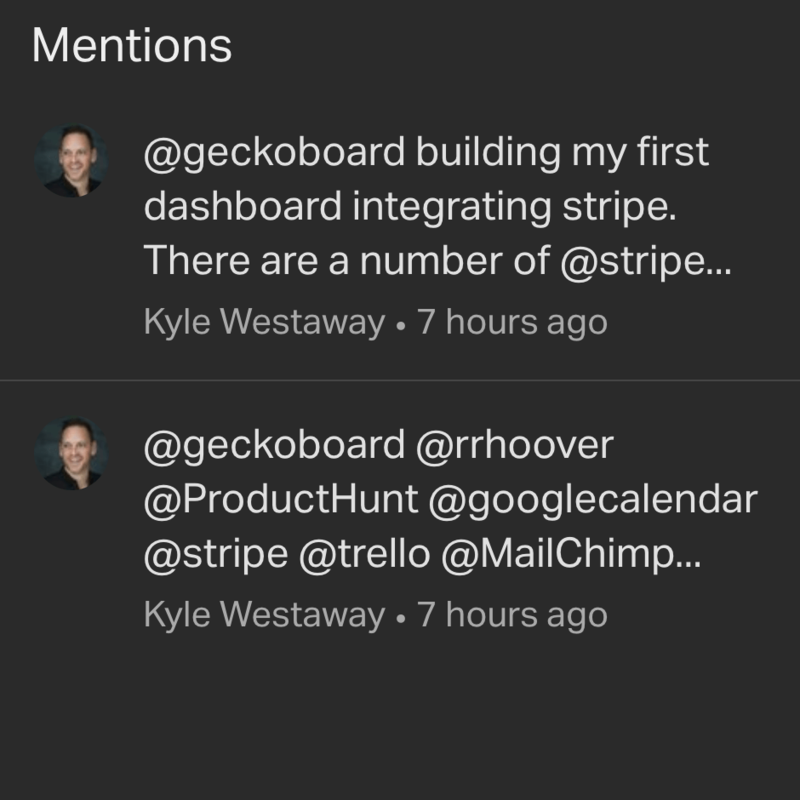 The Mentions widget shows the latest mentions for the connected account. The Favorited Tweets widgets shows the latest favorited tweets of the specified user handle. 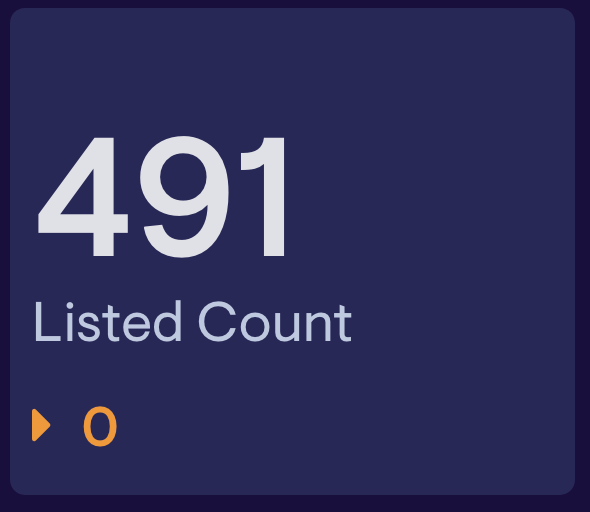 The Listed Count widget shows the number of times a given account has been listed by other Twitter users. 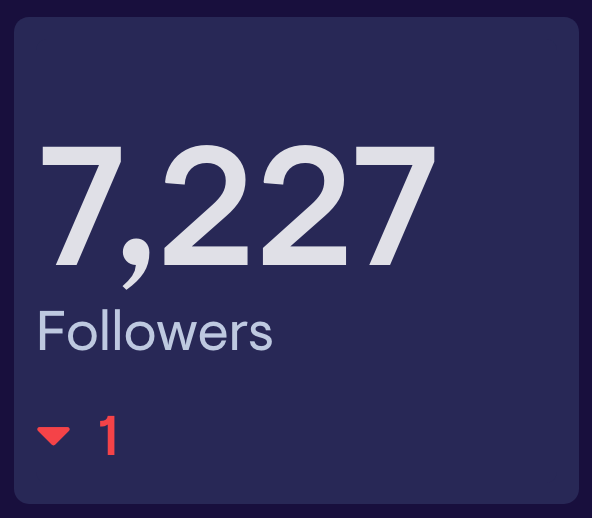 The Follower Count widget shows the number of followers for a given user. 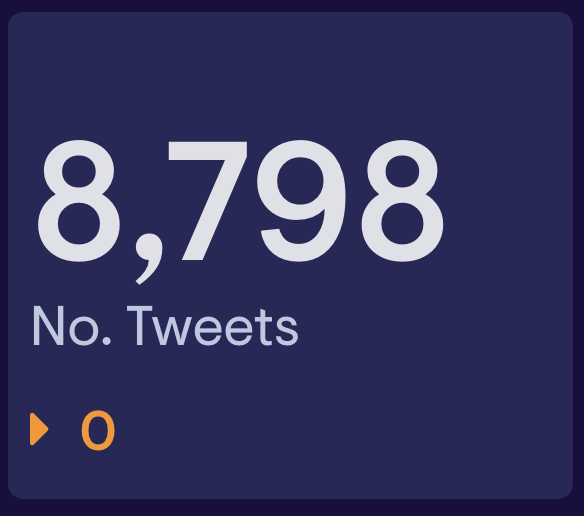 The Tweets Count widget shows the number of Tweets sent for the specified account. 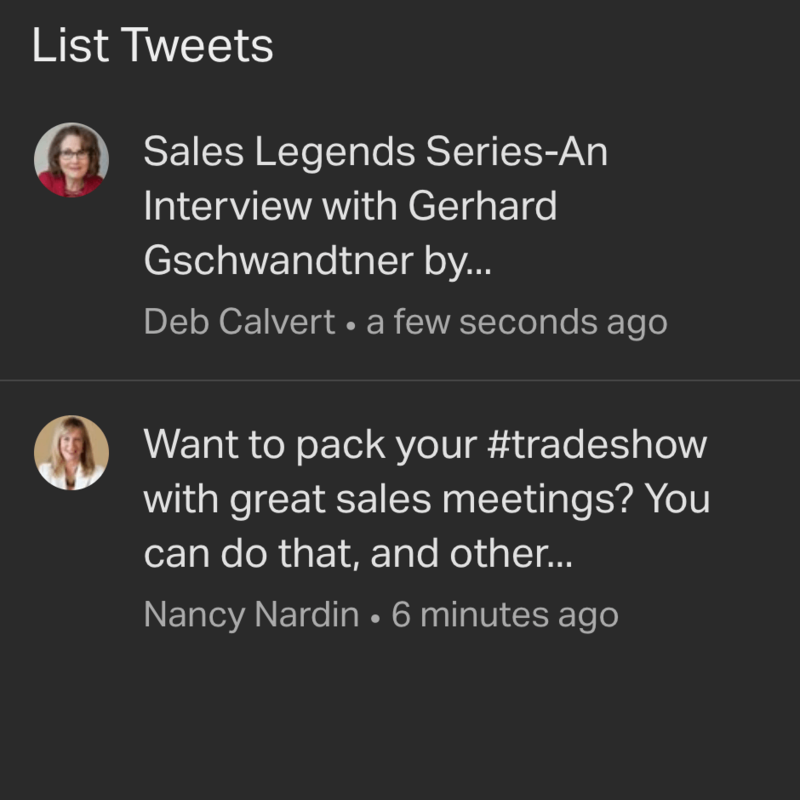 The List Tweets widget shows the latest tweets from a Twitter list you subscribe to. 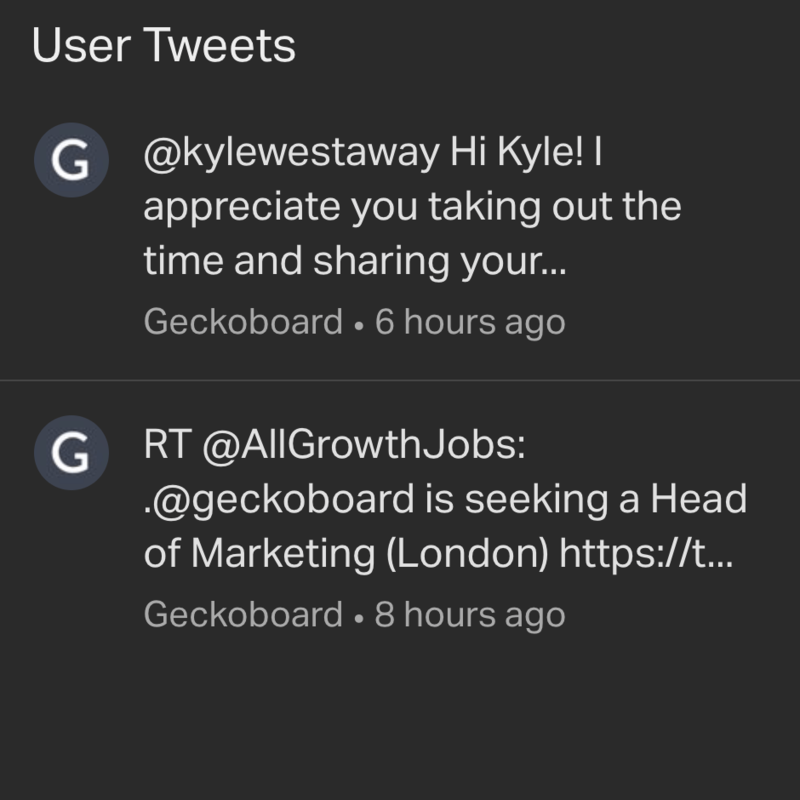 The User Tweets widget shows latest tweets from a Twitter user. 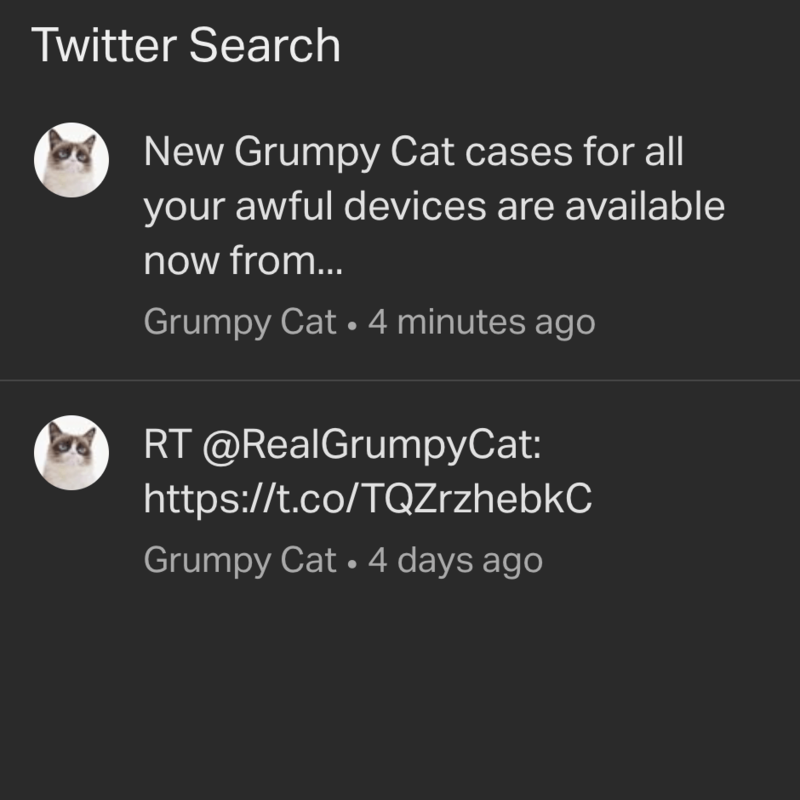 The Twitter Search widget allows you to display the results of a Keyword or @username search. We also support most of Twitter's advanced search. 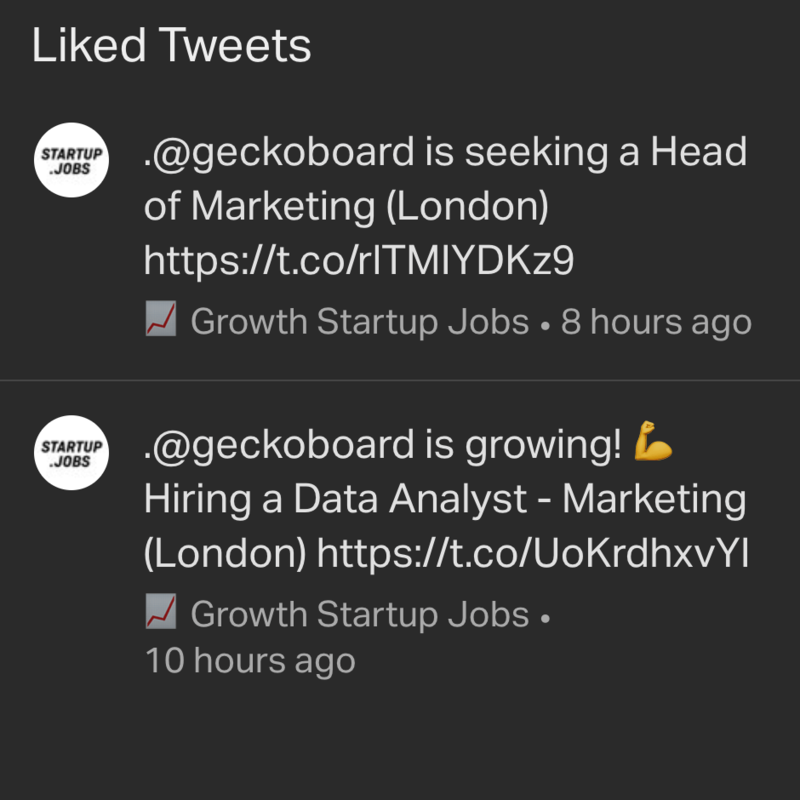 Zapier offer a guide to using Twitter's advanced search. Currently, we don't support the attitude operators —i.e. :) and :( — and the near: operator. 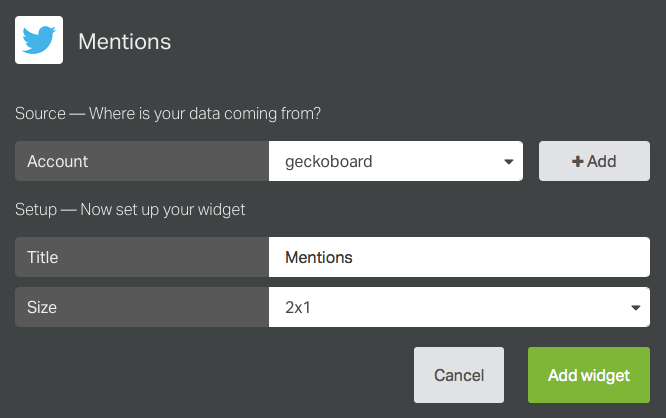 To search for the keyword dashboards, use the following widget configuration shown below.